Rómulo Gallegos is best known for being Venezuela’s first democratically elected president. But in his native land he is equally famous as a writer responsible for one of Venezuela’s literary treasures, the novel Doña Barbara. Published in 1929 and all but forgotten by Anglophone readers, Doña Barbara is one of the first examples of magical realism, laying the groundwork for later authors such as Gabriel García Márquez and Mario Vargas Llosa. Following the epic struggle between two cousins for an estate in Venezuela, Doña Barbara is an examination of the conflict between town and country, violence and intellect, male and female. Doña Barbara is a beautiful and mysterious woman—rumored to be a witch—with a ferocious power over men. When her cousin Santos Luzardo returns to the plains in order to reclaim his land and cattle, he reluctantly faces off against Doña Barbara, and their battle becomes simultaneously one of violence and seduction. All of the action is set against the stunning backdrop of the Venezuelan prairie, described in loving detail. Gallegos’s plains are filled with dangerous ranchers, intrepid cowboys, and damsels in distress, all broadly and vividly drawn. 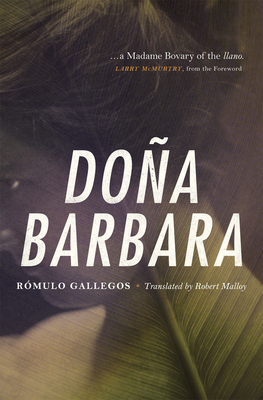 A masterful novel with an important role in the inception of magical realism, Doña Barbara is a suspenseful tale that blends fantasy, adventure, and romance. Hailed as “the Bovary of the llano” by Larry McMurtry in his new foreword to this book, Doña Barbarais a magnetic and memorable heroine, who has inspired numerous adaptations on the big and small screens, including a recent television show that aired on Telemundo. Rómulo Gallegos (1889–1969) was a Venezuelan novelist and politician who served briefly as the nation’s first democratically elected president. After publishing Doña Barbara, he was forced to flee to Spain but returned in 1936 to hold a variety of political offices. He was again forced out by a coup d’etat in 1948, returned in 1958, then was elected senator for life. Unlike the austere plain I grew up on, Gallegos’s llano is steamy, tumescent, lust-driven. Dona Barbara may have been a kind of anticipation of Eva Peron. She owns a great ranch, the Altimara, but must struggle constantly to keep it. She is, in her way, a tragic heroine, seeking to attract a decent lover, while giving herself day and night to very coarse lovers indeed. She is, however, very vividly drawn, a Bovary of the llano. In the prose one will now and then hear Conradian echoes, and certainly there are echos of Gallegos in Garcia Marquez, Vargas Lhosa, and Fuentes. Let us hope this attractive reprint will bring Romolo Gallegos the readers he deserves.